nikkistyle™: Spring Trend: Retro Jumpsuits Are Back Again, Paying Homage to the 1970s! Spring Trend: Retro Jumpsuits Are Back Again, Paying Homage to the 1970s! Style Notes | I vividly remember an old photo of my mom wearing a baby blue silk jumpsuit back in the '70s. And I kid you not ... she looked super fly! Today, nearly four decades later, the 'retro' jumpsuit re-emerges yet again for spring. 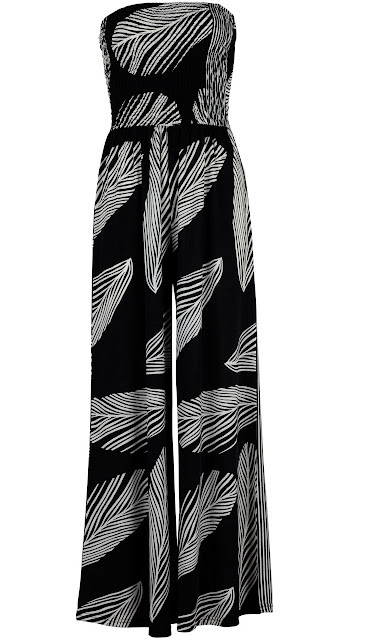 Editor's Pick: The featured strapless feather print jumpsuit is affordable, and is certainly on-trend this season. psst! And check this out: The piece is transitional. Style it for day, or evening! Give it a try, shop the look at AX Paris USA.